Welcome to the great state of Maine! From the pristine wilderness of the conifer and hardwood forests that cover 89% of the state, to the magnificent rocky coastline of the north, to the long sandy beaches of the south, Maine is truly a scenic wonder. Picturesque lighthouses and quaint fishing villages add to the natural splendor of the coastline. Majestic homes of 19th century sea captains, many with their original widow's walks, grace the seaside towns. Humorist Will Rogers remarked, "Did you ever see a place that looked like it was built to enjoy? Well this whole state of Maine looks that way." 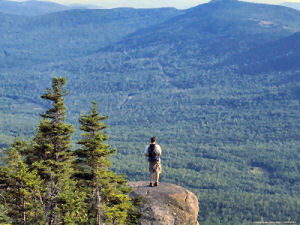 Maine isn't just about beautiful scenery and wilderness. Maine's history and economy have been linked to vast timber reserves and to the sea; in this case, the Atlantic Ocean. The abundance of timber served the state well as Maine became noted for its shipbuilding in colonial times. The first ship built and launched in western hemisphere was the Virginia, launched in 1607. Shipbuilding continued to flourish in Maine as the manufacture of wooden ships gave way to iron and steel. The first atomic submarine, the Swordfish was built in Maine. On the other end of the scale, Maine produces more canoes than any other state in the union. Though the wooden shipbuilding industry disappeared long ago, Maine forests continue to provide the raw resources for its most important manufactured products; cardboard boxes, paper bags, wood pulp, and paper. Maine's blueberry harvest is the largest in the nation, yielding almost all the low bush blueberries grown in the United States. Potatoes are a major product of Maine, growing well in the cool north. 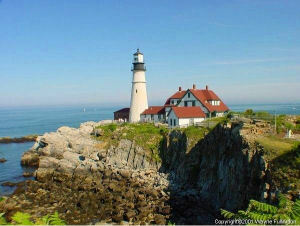 And the state is famous for delicious shellfish, too, especially clams and the famous Maine lobster. Maine's yearly lobster catch is larger than any other state. It is really not known how the name for this state originated. One theory suggests that the state was named by French colonists after the French province of Mayne. Another mentions that "Main" was a common term to describe a mainland. This common nickname for Maine is given because of the extensive pine forests that have covered the state. The White Pine is considered to be the largest conifer in the northeastern United States and some of the tallest trees in eastern North America grew in Maine. The White Pine has played an important part in the history of Maine and has been afforded appropriate recognition. In the early days of colonization, the tall White Pines of Maine were valued for ship's masts. When Maine chose a state floral emblem in 1895, it chose the White Pine Cone and Tassel. As you might guess, the White Pine Cone and Tassel is not, biologically, a flower. The pine cone is known as a strobilus. In fact, one could say that Maine is the only state to have an Official State Strobilus. The White Pine, the Official State Tree, is also present on the Great Seal of Maine and, by way of the seal, on the State Flag. According to Dave Martucci, the first Official Maine State Flag, adopted in 1901, displayed a tall pine tree in the center of the flag and a blue polar star in the upper left-hand corner. Maine has been a leading producer of lumber products. Because of this and the large number of people involved in the lumber industry, Maine has been called "The Lumber State." Today, almost 89% of the state is forested. Maine is currently the home of many of the largest paper producing mills in the country. Many forms of Maine paper products are used in schools and offices throughout the country. This nickname was given to Maine because its northern border is with Canada. This nickname, refers to Maine's state motto, Dirigo, meaning "I direct" or "I guide." Maine is another state that was designated "The Switzerland of America" because of its mountains and snowfall. Maine has been called "The Polar Star State" because of its position as one of the northernmost states and because of the North Star on its Coat of Arms. People who live in or come from Maine are called Mainers. Variants of this are Maine Staters and State of Mainers. You may also hear Mainers referred to as Down Easters (because of the eastern longitudes of the state). Foxes - Mainers were sometimes referred to as Foxes because of the abundance of foxes roaming the pine forests in which Mainers often worked. Lumberjacks/Lumbermen - Because of the vast timber resources of Maine, one of the cheif occupations of Mainers was lumbering. Pine Trees - Somewhat funny to think about, but residents of the Pine Tree State were sometimes referred to as pine trees themeselves. The Maine quarter is the third quarter of 2003, and the 23rd in the 50 State Quarters® Program. Maine became the 23rd state to be admitted into the Union, as part of the Missouri Compromise on March 15, 1820. The Maine quarter design incorporates a rendition of the Pemaquid Point Light atop a granite coast and of a schooner at sea. Pemaquid Point Light is located in New Harbor, and marks the entrance to Muscongus Bay and Johns Bay. Since the beginning of ship activity in the area, a shoal created hazardous navigation conditions, causing many shipwrecks. As maritime trade increased in the area, so did the need for a lighthouse. In 1826, Congress appropriated funds to build a lighthouse at Pemaquid Point. Although the original building was replaced in 1835, and the original 10 lamps in 1856, the light is still a beacon for ships and remains one of Maine's most popular tourist attractions. The schooner resembles "Victory Chimes, " the last three-masted schooner of the Windjammer Fleet. "Victory Chimes" has become synonymous with Maine windjamming. Maine (From Sea to Shining Sea) , by Christine Webster. 80 pages. Publisher: Children's Press(CT) (March 2003) Reading level: Grades 3-5. Presents information about Maine's people, geography, history, landmarks, natural resources, government, state capitol, towns and cities, and more. Maine (World Almanac Library of the States) , by Deborah H. Deford. 48 pages. Gareth Stevens Publishing (February 2003) Reading level: Grades 4-6. Filled with the most up-to-date information, including the latest Census results. Full-color photos bring to life the story of Maine. In addition to an in-depth factual profile of Maine in the form of a state Almanac, this book offers fascinating and lively discussions of the state's history, people, geography, government, economy, culture, and lifestyles. A section on Notable People, a calendar of events, and enough primary source documents, time lines, maps, and other tools to make this unquestionably the best young adult reference material on the USA available anywhere. Maine: The Pine Tree State from Prehistory to the Present , Edited by Richard W. Judd, Edwin A. Churchill, and Joel W. Eastman. 616 pages. Publisher: Univ of Maine Press; 1st edition (December 1994) Maine: The Pine Tree State surveys the region's rich history from prehistoric times to the early 1990s. Drawing on a team of twenty-six scholars with a professional interest in Maine's past, the book features fresh research and new interpretations of even familiar periods such as the Civil War. The chapter authors are respected authorities in Maine history from the fields of archaeology, anthropology, ethnic studies, and the various sub-disciplines of history: political, cultural, economic, labor, military, maritime. Certain themes recur from chapter to chapter and across historical periods. For example, larger structural changes in the nation - market trends, wars, economic fluctuations, demographic flows - strongly affected the everyday world of Maine people. Other prominent themes are the importance of geography and the environment in shaping Maine's economy and culture. Caught up at times in national events, Maine has also led the nation in important ways. Its fishing industry fed and its textile industry clothed the nation's people. Maine loggers contributed heavily to the technologies used in cutting, hauling, and driving timber. Maine excelled in the production of wooden ships and supplied the expertise to sail them. In the nineteenth century Maine's political leaders were among the most powerful in the nation, and Maine's contribution to social reform attracted national recognition. .
Coastal Maine: A Maritime History , by Roger F. Duncan. 573 pages. Publisher: Countryman Press; 1 edition (June 2002) A fascinating and comprehensive chronicle of four hundred years of maritime history along the Maine coast. Roger Duncan recounts four hundred years of Maine's rich maritime history, from the early seafarers' discovery of its valuable resources and the families that settled the land, to Maine's role in the history of the US in peacetime and in war. He traces the changes in Maine's economy over the past century: the demise of the coastal trade; the burgeoning popularity of pleasure boating after World War II; the hardships that beset the fishing and lumber industries; and the rise of tourism. This anecdotal panorama of people, land, boats, and water will absorb historians, nautical enthusiasts, and New Englanders alike. The Maine Reader , Edited by Charles & Samuella Shain. 576 pages. Publisher: David R Godine (August 1, 1997) Here, in one large volume, is a book that captures the full sweep of Maine's culture and history, from the first dazzled vision of the European explorers to the modern prose of Carolyn Chute and John McPhee. Thoughtfully edited, illustrated with photographs of documents, buildings, and personalities, this compendium brings to life a state that has always maintained its own character and independence. All the great figures who were ever born in, have inhabited, or have written about Maine can be found in these pages, including (among many others) Longfellow, Thoreau, Jewett, Millay, Beston, and Gould. In addition, the editors have uncovered small unknown gems: the journal of a foot soldier marching with Benedict Arnold and the bawdy memoirs of a sea captain's wife. Illustrated with over fifty splendid halftones, this collection - the most complete and entertaining selection of Down East writing yet assembled - will be indispensable reading for anyone who has ever succumbed to the charms of the Pine Tree State..